For the past 32 years, we have polled first-year biology students annually at the University of New South Wales concerning their views about evolution and creationism. The purposes of the research were to identify the level of commitment among incoming students to creationist beliefs that could interfere with their receptivity to evolutionary science and to assess in retrospect whether these creationist beliefs were changing over time. The very low and declining levels of commitment to the creationist view that god created humans de novo suggests this view is unlikely to be a significant obstruction to accepting the scientific evidence for evolution. The results of the survey of UNSW students correlate with changes documented in the census of the general Australian public suggesting that our survey results of first-year biology students reflect overall changes in the Australian community as a whole. Public attitudes toward evolutionary science are shaped in part by the instruction that young adults receive in universities and colleges. However, new students do not arrive as a tabula rasa. The students’ receptivity to the teaching of evolutionary science will be influenced by beliefs acquired from their families, schools, communities and religious organisations. As will be detailed below, what little is known about the views of university students is limited in the main to a handful of relatively short-term surveys scattered across time and institutions. The present paper reports a secondary analysis of the cumulative results of a poll of Australian university students in a first-year biology course concerning their broad beliefs about human evolution and creationism. The ongoing poll has been conducted annually for 32 consecutive years between 1986 and 2017. The intent of the poll has been pedagogical. First, it has provided the lecturer with a basic understanding about the level of commitment among incoming students to creationist beliefs which could interfere with their receptivity to evolutionary science. Depending on the outcome of the poll, the ways in which the science of evolution is taught might need revision. Second, analyses of the results of all previous polls conducted in this course have provided an opportunity to assess how student views, on average, are or are not changing over time. In lectures given subsequent to the one in which the poll is run, the results of the anonymous survey for their class and those of all previous years have always been openly presented to the class for the interest of all students. When our poll was first conducted in 1986, we had no idea what proportion of students embraced creationist convictions that god(s), rather than natural evolutionary processes, were responsible for the existence of humans. In a 1986 census of the general Australian public, 75% of adults claimed a nominal identification with a religion, mostly some form of Christianity (73%) (Anon 1994). However, what proportion adhered to the belief that humans were created by god(s) was not assessed. Unlike the United States, debates in Australia about the teaching of evolutionary science in schools and the injection of creationism into school biology classes have not gained much public traction. The official biology curriculum for both state-based public schools and church-run schools in New South Wales has consistently reflected conventional evolutionary science and not creationism (Anon 2013). Discussion of creationism has, however, been regarded to be appropriate for courses about religion. Accordingly, to determine the distribution of incoming students’ views in the first-year biology course in UNSW, we first implemented the poll in 1986 and conducted it every year thereafter. Reports of long-term trends in views about the origins of humans are rare and in most cases limited to surveys of adult populations in the USA. Plutzer and Berkman (2008) amalgamated findings from several polls, most notably the results of a Gallup poll about American values and beliefs conducted periodically since 1982. Newport (2014) has reported results of the same Gallup poll that accumulated between 1982 and 2014. These have been further supplemented by analysis of the results from the 2017 Gallup poll (Anon 2018a). Twenge et al. (2015) reported results based on ‘General Social Survey’ data spanning 1972 to 2014 for change over time in religious orientation among adolescents in the USA. Twenge et al. (Twenge et al. 2016) similarly reported an analysis of changes in adult religious participation in the USA based on the same survey data. Relevant to our poll in UNSW, one of the Gallup questions asked respondents, in demographically-weighted samples of > 1000 American adults, to select one of four statements that best reflected their beliefs about human origins. The options included: (1) a creationist statement that a god had created humans a few 1000 years ago; (2) a theistic evolutionary statement that humans evolved over several million years but the process was guided by god; (3) a non-theistic statement that humans evolved without any guidance from god; and (4) a statement that the respondent had no opinion about the matter. Over the period assessed, there have been only modest changes in American responses which in the main endorse one of the god-caused/guided options. The overall percentage of respondents choosing the creationist option has fluctuated between 42 and 47%, dropping to 38% in 2017. The percentage selecting theistic evolution has been lower but still substantial, fluctuating between 31% and 40%, and 38% in 2017. Although relatively few tended to select the non-theistic option, the percentage who did having risen slowly from 9% in 1982 to 19% in both 2014 and 2017. Finally, the undecided/no-opinion option was chosen by only 5–9% of the respondents over the same period. Unfortunately for the purposes of direct comparison, Newport (2014) did not provide a demographic breakdown that would enable us to make direct comparisons with the results of our long-term survey of university students. However, two studies that were conducted in the United States, the two separated by 39 years, used a similar question answered by substantial numbers of students. In the first study, Bergman (1979) polled 442 undergraduates at a state university in Ohio. Among the respondents, 43% endorsed creationism, 46.4% endorsed theistic evolution, 7.9% endorsed non-theistic evolution, and 2.7% endorsed “other”. More recently, students were surveyed at three small Midwestern institutions (N = 591) (Barnes et al. 2008). Among these students, 41.6% endorsed creationism, 21.6% endorsed theistic creation, and 36.2% endorsed non-theistic evolution (it is unclear from the publication what declaration if any was made by the remaining 0.6% of those surveyed). These two studies suggest that support for creationism among students in the USA held steady in the 40% range, a level consistent with that of support in the general population over approximately the same time span. On the other hand, support for theistic evolution appears to have fallen away. In the 1979 study, 46.4% of the students endorsed theistic evolution (Bergman 1979) which appeared to be similar or possibly even higher than that seen in the general population. However, in the 2008 study, only 21.6% of the students supported theistic evolution. Conversely, student endorsement of non-theistic evolution showed a commensurate rise to 36.2%, well above the level of 14% in the general population in 2008. Although this pair of findings is intriguing, they only provide snapshots of the underlying trends over the two widely separated times. They do not reveal what variation between them may be due to sampling error plus any subtle differences arising from the wording of the questions or the administration of the survey. Further, the results are only based on the attitudes of some students at American universities at specific points in time. Accordingly, by analyzing the accumulated responses to our poll, we aimed to provide a more continuous picture of what trends and variation have occurred among successive cohorts of students over 32 years at a large state university in Australia. Our poll had the advantage of being conducted in a consistent fashion using the same question always administered in the same way by the same person (M. Archer) explaining the same reasons for the survey to the students at the same time in the course. Factors limiting our ability to generalise the results of this poll are noted in the Discussion section. From 1986 to 2017, every student attending the first year biology course (BIOS1101) was invited to complete a one-item poll on a strictly anonymous basis. As they entered the lecture theatre, each student was handed a slip of paper and asked to circle one of following options, the one with which they most agreed. This survey question and response options were deliberately framed to closely approximate those routinely asked in Gallup polls conducted in the United States (e.g., Newport 2014). The question was designed to assess the level of commitment participants have to one of three views: that god created human beings de nova pretty much in their present form within the last 10,000 years; god guided the process of human development from less advanced forms over millions of years; or that human beings developed over millions of years from less advanced forms of life and god had no part in this process. Each year from 1986 onwards, the senior author, M. Archer, explained to the students that the poll was conducted to discover the balance of opinions among students in this course. In making their selection, the students were instructed not to write their name on the paper to ensure their responses were completely anonymous. If they had any reservations, they were asked not to fill out the form. The students were then requested to fold up the slip of paper and at the end of the lecture to deposit it in a box that had been left at the exit. Students were told, in the week following the survey, what the results of the poll were for their class and those of previous years. As first year university students, the age of all individuals sampled was approximately 18. Because of the interval of years during which this survey was conducted, it sampled Gen X (born 1961–1979) individuals in survey years 1986 to 1997, Millennial (born 1980–1994) individuals in survey years 1998 to 2012, and iGen (born 1995–2012) individuals in survey years 2013 to 2017. Temporal change in the percentage of respondents selecting each option was analysed by linear (options 1 and 3) or polynomial (options 2 and 4) regression, with model fit assessed by plots of the residuals versus fitted values. The proportion of variance explained by each regression model was quantified by R2 (Anon 2018b). Analyses were conducted in R (version 3.4.4). The conduct of the poll and publication of the results has been approved by the University of New South Wales Human Research Ethics Advisory Panel (Approval File 2692). Successive directors of first year biology and the staff of the biosciences student office have approved the poll. Table 1 is divided into six columns. The first column shows the year in which the poll was conducted. The second column shows the number of students who submitted a response to the poll. The remaining columns show the percentage of respondents who choose options 1–4, respectively. Inspection of the table reveals that the number of students responding to the poll from 1986 to 2008 averaged 530. Since 2009, the number of respondents has steadily fallen, while the number of students enrolled in first-year biology at UNSW has remained steady, averaging 467 students per year. In 2017, 419 students were enrolled in the course, and 415 completed the course. The reduction in responses reflects a sharp university-wide decline in the number of students physically attending lectures, which has coincided with the growing accessibility of recordings of lectures and visual material on UNSW’s internal internet which is only available to staff and students of UNSW. Because we did not count the actual number of students who did attend each class surveyed, we do not have exact response rates. However, as far as can be ascertained from the number of responses, the percentage of students providing these appeared to always be proportional to the size of the classes surveyed, suggesting that response rates over the entire time of the survey have been similar. Figure 1a plots the percentage of responses to each option for each year, with the best fitting model for each response (a linear model for the theistic evolution and uncertain options, and a 2nd-order polynomial model for the non-theist and creationism options). Inspection of the figure reveals the following features. First, the percentage of students who chose the creationist option was low and declined over the years surveyed, ranging from a high of 17.3% in 1988 to a low of 3.6% in 2017 (Fig. 1a, polynomial regression model, p < 0.001, R2 = 47%). Second, in 1986, 50% of the students selected the option for theistic (god-guided) evolution. Since then, the percentage choosing that option has consistently declined, reaching 25.2% in 2017 (Fig. 1a). This decline is best explained by a strong downward linear trend of 0.88 percentage points per year, with the model explaining a high proportion of the variance (R2 = 0.86, r = 0.93, p < 0.001). Third, while the percentage of students choosing either the creationist or theistic evolution option has declined, the percentage of students selecting the non-theistic evolution option has steadily increased at a slightly increasing rate from 25.1% in 1986 to 62.2% in 2017 (Fig. 1a). The best fitting model was a 2nd order polynomial model with statistically significant (p < 0.001) and positive coefficients, explaining 83% of the variance (as measured by R2). Fourth, the percentage of students selecting the uncertain option remained low, averaging 8.6% (Fig. 1a). There was no evidence for any change in the percentage that chose this option across all years surveyed (p = 0.32). The results reported here are based on a secondary analysis of the accumulated results of an annual poll of first-year biology students at the University of New South Wales regarding their views on the origin of humans. The poll was conducted to gauge the opinions of new university students that could affect their initial receptivity to scientific research about evolution. An earlier paper (Archer 1994) reported preliminary results spanning the years 1986 to 1994 but there has been no statistical analysis of any of the data until now. There were two main findings. First, the percentage of our Australian students endorsing the creationist option has been consistently small, averaging 10.4%, and slowly declining. Second, there has been a striking cross-over in the opinions of the successive cohorts of students. In 1986, 60% of the students endorsed either the creationist option (10%) or the theistic evolution (god-guided) option (50%). By 2017, the proportion of students endorsing either of the theistic options had fallen by 31.2 percentage points to 28.8%, more specifically 3.6% for the creationist option and 25.2% for theistic evolution. Conversely, endorsement of the non-theistic option rose by 37.1 percentage points from 25.1% to 62.2%. This rise appears to mirror the fall in endorsement of the theistic options. In summary, opinions among our Australian students that god in some sense is the ultimate or contributing cause of human origins has fallen from being a majority view in 1986 to being a distinct minority view in 2017. This decline markedly differs from what appears to be the case among American university students, particularly with regard to creationism. As recently as 2008, Barnes et al. (2008) found that 41.6% of their cohort of American students endorsed creationism. This is four times higher than the 11.1% we recorded for creationist views embraced by Australian students in 2006 and 2007, the years when Barnes et al. (2008) would have collected their data from American students. With regard to the endorsement of theistic evolution, there may be a parallel between our Australian students and American students. Bergman (1979) reported that among American students, 46.4% endorsed theistic evolution (Bergman 1979), while in 2008, and, similarly, at the start our poll in 1986, 50% of our Australian students endorsed theistic evolution. By 2008, only 21.6% of the American students supported theistic evolution (Barnes et al. 2008). In our corresponding 2006–2007 polls, endorsement for theistic evolution had fallen to, respectively, 35.7% and 31.1%, low levels that have continued to fall since that time. Although the results of the Australian national census appear to reflect the same direction of change in viewpoints that we have documented in our university survey (Fig. 1b), they were not conducted as frequently over the same period of time and only relatively recently enabled respondents to indicate, if it was the case, that they had no religion (Rowe 2017). 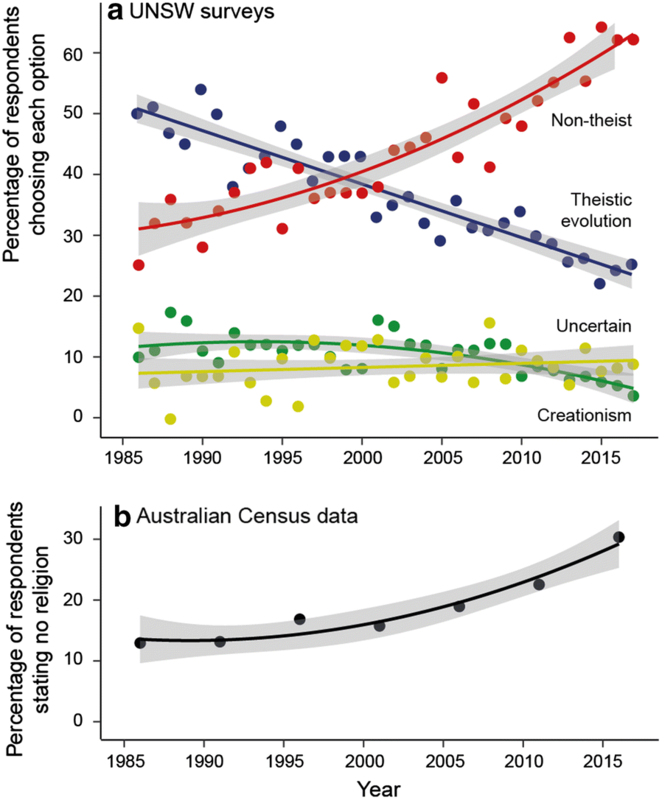 As an example of comparability of results for specific years, in the 2011 Australian-wide national census of the public, 15% responded that they believed in creationism while 51% declared they believed in non-theistic evolution (McCain and Kampourakis 2018). These percentages appear to align with our students’ 2011 percentages, which were 6.8% for creationism and 47.9% for non-theistic evolution. Perhaps the relative alacrity with which Australians appear to be embracing non-theistic explanations for the origin of humans, evidenced by the results of our 32 years survey in UNSW and the Australian Census of the wider public, reflects at least in part a long and apparently growing tradition of relative disinterest in embracing religion. Conclusions concerning the generality of our findings are limited by design. Our annual poll was conducted over 32 years for educational purposes to discover, on the basis of responses to a question routinely used in Gallup polls around the world about the mechanistic origins of human beings, changing opinions among successive cohorts of students taking an introductory biology course taught by the same person at a major Australian university. While one could argue the pros and cons about the reliability of responses to any specific question in Gallup polls, global acceptance that responses to this question are a reasonable if not a good indication of inherent beliefs among respondents urged us to use the same question to achieve the same level of insight that this has provided in many other international studies over long periods of time. Although we do not have long-term hard data about response rates within each of the groups sampled annually, the number of responses per students attending class did not noticeably change over time. When considering whether or not our results reflected the views of the wider community, we could not find a corresponding nation-wide annual poll conducted with the Australian general population over a similar span of time, let alone one that focused on subpopulations such as university students. In terms of comparing our results focused on university students to similar analyses conducted internationally, we could only find one-time surveys of American university students using convenience samples at one or a small number of institutions, findings that have been discussed above. Accordingly, we consider that our findings may be the first continuous annual, long-term analysis of the opinions about creationism versus evolution among first year university students in Australia and, apparently, elsewhere in the world. Given limitations of the present study noted above, we can suggest ways to improve future surveys of this kind. The individual views of incoming students concerning human origins presumably originate in their familial, secondary school, community, religious and/or cultural backgrounds. Downey (2014) has argued, using survey data spanning 1990 to 2010, that a measurable decline in religiosity in the USA is in lockstep with a steep rise in use of the internet. While correlation is not a demonstration of cause and effect, the internet will certainly expose users to an expanding universe of scientific knowledge about evolution which can lead to a decrease in uncritical acceptance of miraculous creation well before students are old enough to enter university. To better understand some of these factors, and to get a better handle on the subsequent impact (if any) of tertiary university education on the views held when they arrive, we suggest the following information could be sought in future. To better understand the origin of a priori opinions among first year university students, there may be value in running a similar annual survey in one or more of the larger ‘feeder’ secondary schools that contribute to a majority of the incoming students in the same university. Smith and Singhal (2017), in an analysis of data recovered from ‘Census 2016’, reported that more than 40% of 795,000 public school students in New South Wales, one of the primary sources for students entering UNSW as undergraduates, nominated ‘no religion’ in response to the question about religious affiliation. Hence it would be useful if the national census could include questions that would enable assessment of long-term changes in the specific views of the public prior to entrance to universities (e.g., belief in a god, commitment to creationism, origin of human beings). In a review of opinions among the general public in 23 nations, McCain and Kampourakis (2018) noted that a 2011 Australian sample revealed that 15% of those surveyed agreed with creationism but 51% agreed with non-theistic (natural) evolution of humans. While these percentages broadly align with our students’ percentages in the year 2011 (6.8% for creationism and 47.9% for non-theistic evolution), comparisons of this kind based on the national view are not available for most of the years over which we ran our survey of undergraduate students. With slight changes to the national census questionnaire, a more detailed assessment of long-term changes in public opinions about these issues would become possible. To assess the potential impact of university education on the a priori opinions expressed by students, it would be useful to run the same survey with as many as possible of the same cohort of students over their next 3 years of coursework. American findings indicate that there are a range of factors that can lead to changes in student opinions throughout their university years (e.g., Paz-y-Miño-C and Avelina 2009). To place changes over time occurring within the Australian community into a broader international context, similar long-term studies would need to be conducted in other countries besides Australia and the USA. In particular, it would be interesting to know how changes in beliefs in god as well as specifically belief in creationism have been changing over time in other countries. Although a short-term, one-off assessment, the McCain and Kampourakis (2018) survey of 23 nations was aimed at assessing commitment in the general public of those countries to beliefs in a god and/or creationism. Among Australian respondents, 29% of those surveyed stated they believed in god but only 15% agreed with creationism. In Indonesia, in which 93% of respondents declared a belief in a god, only 57% agreed with creationism. In contrast, in South Korea, China, and Japan, in which belief in a god ranged from 4 to 17%, agreement with creationism ranged from 10 to 24%. Clearly there are significant, nationally-different commitments to views about the origin of humans, but it is not clear how or how fast these other national views may be changing over time. This poll was undertaken to inform science teachers in the University of New South Wales about the level of a priori commitment first year university students had for Creationist beliefs. Assessing the extent of commitment among incoming students was regarded to be important because those students were likely to be relatively unresponsive to conventional teaching about scientific evidence supporting the reality of evolution. The outcome of the poll would then inform lecturers about whether more or less effort should be made to communicate scientific understanding about evolution. As revealed over the years, the percentage of students endorsing creationist beliefs has remained very low and is declining. In contrast, the percentage of students convinced that gods had no part in the evolution of humans has grown steeply over time, representing approximately 62% of students surveyed in 2017. That said, approximately 25% of students surveyed in 2017 endorsed a conviction that a god was somehow involved in or influenced the origin of humans. Although their commitment may be less doctrinaire than that of creationists, it also represents a steadily declining proportion of the student body over the years, dropping by 50% since 1986. In all measures of commitment to a role for a god in the origin of humans, Australian students appear to be more rapidly embracing a non-theistic explanation than students in the USA. This may relate at least in part to a difference in the way the cultures of the two countries have developed over time. Authors who analysed the data: MA AGBP AMH HB SB MH NPA DJB EJK. Authors who contributed materials/analysis/tools: MA AGBP AMH HB SB MH, NPA, DJB, EJK. Authors who wrote the paper: MA, AGBP, HB, EJK. All authors read and approved the final manuscript. We thank many individuals and organizations for discussions about the significance of the results that have accumulated over the last 32 years, and we thank teachers at several secondary schools in New South Wales for helping to trial-run surveys with a range of high school students. We thank the thousands of students at UNSW who consented to complete our poll since 1986 and the staff in the biosciences student office who each year helped to distribute, collect and collate the results. Finally we thank the many secondary school teachers in Australia who clearly have been doing an increasingly effective job in communicating the scientific facts to high school students about the origin of the natural world. Anon. Australian social trends; 1994. http://www.abs.gov.au/AUSSTATS/abs@.nsf/2f762f95845417aeca25706c00834efa/10072ec3ffc4f7b4ca2570ec00787c40!OpenDocument. Accessed 1 June 2018. Anon. Losing my religion. Australian Bureau of Statistics; 2013. Press release no. 4102. http://www.abs.gov.au/ausstats/abs@.nsf/Lookup/4102.0Main+Features30Nov+2013. Accessed 30 Mar 2018. Anon. Evolution, creationism, intelligent design; 2018a. http://news.gallup.com/poll/21814/evolution-creationism-intelligent-design.aspx. Accessed 4 June 2018. Anon. Coefficient of determination; 2018b. https://en.wikipedia.org/wiki/Coefficient_of_determination. Accessed 30 Mar 2018. Downey AB. Religious affiliation, education and internet use. Cornell University Library; 2014. arXiv:1403.5534 [stat.AP]. Accessed 30 Mar 2018. Newport F. In U.S., 42% believe creationist view of human origins; 2014. http://www.gallup.com/poll/170822/believe-creationist-view-humanorigins.aspx?g_source=position1&g_medium=related&g_campaign=tiles. Accessed 30 Mar 2018. Rowe E. Religion in Australian schools: an historical and contemporary debate. The conversation; 2017. https://theconversation.com/religion-in-australian-schools-anhistorical-and-contemporary-debate-82439?utm_medium=email&utm_campaign=Latest%20from%20The%20Conversation%20for%20August%2024%202017%20-%2081416603&utm_content=Latest%20from%20The%20Conversation%20for%20August%2024%202017%20-%2081416603+CID_d7fcaa36be969d432de045b9f223cd3b&utm_source=campaign_monitor&utm_term=Religion%20in%20Australian%20schools%20an%20historical%20and%20contemporary%20debate. Accessed 30 Mar 2018. Smith A, Singhal P. More than 40 per cent of NSW school students nominate ‘no religion’: new data. Sydney Morning Herald; 2017. http://www.smh.com.au/national/education/more-than-40-per-cent-of-nsw-school-students-nominate-no-religion–new-data-20170724-gxhi58.html?promote_channel=edmail&mbnr=MjI3NjUzOA&eid=email:nnn-13omn654-ret_newsl-membereng:nnn-04%2F11%2F2013-news_am-dom-news-nnnageu&campaign_code=13INO010&et_bid=29087837&name=40_smh_newsalert&instance=2017-07-24–19-21–UTC. Accessed 30 Mar 2018. Twenge JM, Exline JJ, Grubbs JB, Sastry R, Campbell K. Generational and time period differences in American adolescents’ religious orientation, 1966–2014. PLoS ONE. 2015; 10(5):e0121454. http://journals.plos.org/plosone/article?id=10.1371/journal.pone.0121454. Accessed 30 Mar 2018. Twenge JM, Sherman RA, Exline JJ, Grubbs JB. Declines in American adults’ religious participation and beliefs, 1972–2014. SAGE Open; 2016. p. 1–13. http://journals.sagepub.com/doi/10.1177/2158244016638133. Accessed 30 Mar 2018.